The Nestlé boycott puts pressure on the largest baby food company to change how it markets baby foods. If the Nestlé boycott had achieved its aims it would no longer be necessary. However, Nestlé has rejected Baby Milk Action’s four-point plan for saving infant lives and ultimately ending the boycott. It prefers to invest in countering the boycott and trying to improve its image rather than make the required changes to its policies and practices. Nestlé continues to break international marketing rules. In global monitoring Nestlé and Danone stand out as the worst companies (Danone is targeted with the DanoNO campaign). The boycott is one part of a multi-faceted strategy that includes monitoring companies and working for legislation and other measures to hold them to account at national and international level. Even though Nestlé sometimes appears to be an unmovable object, the boycott does force changes in its policies and practices as explained below. Baby Milk Action promotes the boycott in the UK and is the secretariat for the International Nestlé Boycott Committee (INBC), involving groups that promote the boycott in other countries. However, many people support the boycott without necessarily knowing there is up-to-date information available, so please do share Baby Milk Action’s boycott page with friends and colleagues. The boycott keeps the issue of Nestlé’s bad practices in the public eye. Readers of Ethical Consumer voted Nestlé the “least ethical company of the last 25 years” in 2015. 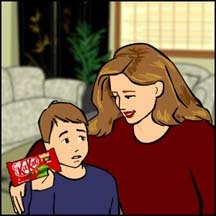 For example, when Nestlé and Google announced in September 2013 that the next Android operating system would be called KitKat, influential business publication Forbes reported, Google Might Have Walked Into A Nestle Boycott Problem With Android KitKat and directed people to Baby Milk Action’s Nestlé boycott page for the latest information. There was much discussion on social media and Joy of Tech produced a cartoon about the ethical issues (click on the thumbnail for full version). 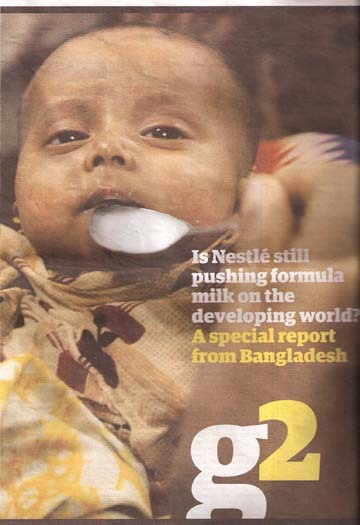 This means that Nestlé executives and investors have to pay attention to the baby milk issue. Unfortunately, Nestlé decided long ago to invest in Public Relations strategies to try to divert attention (see the analysis in our 2013 report, Nestlé Creative Storytelling Venture). The greatest movement comes when there is most public interest in the campaign. Today the boycott focuses on Nescafé coffee, Nestlé’s flagship brand, but people are encouraged to boycott all Nestlé products – see the Nestlé boycott product list. They can also use declare their homes and workplaces Nestlé-Free Zones. Here are some examples of how the boycott has helped to protect babies, mothers and their families over the years. The original boycott in the 1970s led directly to the introduction of the International Code of Marketing of Breastmilk Substitutes by the World Health Assembly in 1981. That should have led to an end to the problem, particularly after Nestlé promised to abide by the Code in 1984 and the boycott was suspended. However, Nestlé broke its promises and the boycott was re-launched. The boycott helps to alert policy makers to the need for legislation – and to be wary when Nestlé tries to persuade them it can be trusted to behave ethically without regulation. Today over 70 countries have legislation implementing the marketing rules that companies should follow ‘independently of national measures’. In some countries this is having a dramatic impact in protecting breastfeeding. Nestlé has stopped some of its more outrageous marketing strategies after these have been exposed as part of the boycott campaign. For example, it eventually promised on 14 October 2014 to stop claiming its formula is the ‘natural start’ after we exposed this in our campaigning, including a twitter campaign during its prestigious Creating Shared Value Global Forum the week before. We will keep monitoring to confirm it implements its promise to drop this claim. However, it continues to defend claims such as its formula ‘protects’ babies and is the ‘gentle start’ and so we will keep up the pressure for it to drop these as well. 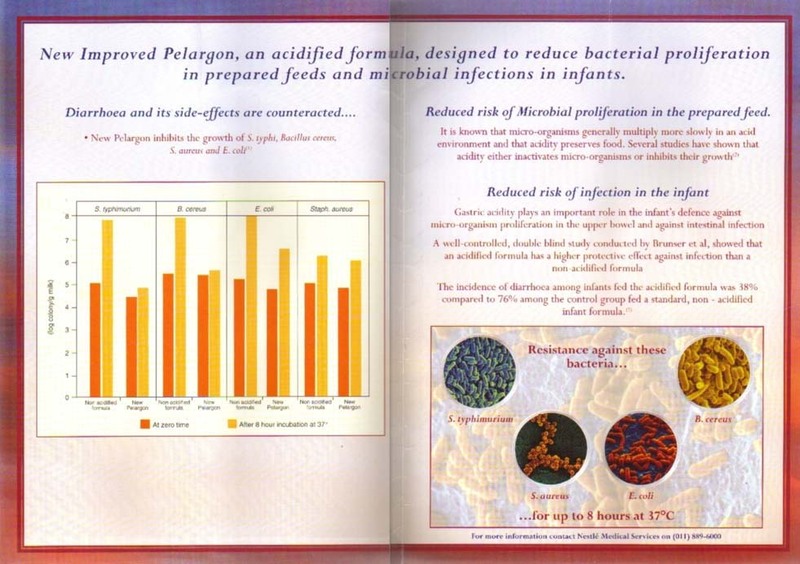 In other examples, it said it would stop claiming its formula is The new “Gold Standard” in infant nutrition after receiving thousands of emails from boycott supporters. This was one of just four violations in the Breaking the Rules, Stretching the Rules 2010 report Nestlé agreed to stop – out of 130 violations. Just asking Nestlé to stop violations does not work – it takes pressure from the public. A feature film examining Nestlé’s practices had a hugely successful world premiere at the Toronto International Film Festival on 8 September 2014 and is due to go on global release. It has been directed by Oscar-winner Danis Tanovic, involves the producers of Girl with a Pearl Earring and The Railwayman, and has an international cast of stars from India, Germany and the UK. It is based on the experiences of Nestlé whistle blower, Syed Aamir Raza, and the support Baby Milk Action and our partners gave him in taking on Nestlé in Pakistan. Baby Milk Action acted as consultants to the writers to ensure it is accurate. Further details on our special Tigers webpage. The film exposes the influence of companies over health workers and will hopefully increase pressure for regulation. For many years Nestlé refused to label formula in the correct language for the country where it was sold. In the case of Malawi, for example, Nestlé said it would not add Chichewa, the national language, due to ‘cost restraints’. This was one case featured in an investigation by Mark Thomas for Channel 4 television in 2000 (warning: contains some strong language). It is interesting to see in the film how Nestlé dismisses report of violations of the marketing requirements when these are reported to it – it has not changed in this regard. Nestlé denies its own responsibilities and only makes required changes under pressure. Nestlé’s Chairman, Peter Brabeck-Letmathé, made a statement for a follow-up programme promising a review of labels in all countries. The above films and many other examples of media coverage over the years have come about because the boycott campaign puts Nestlé in the spotlight. As a consequence the issue of baby milk marketing as a whole is addressed. Baby Milk Action worked with Richard Howitt MEP, who appears in the first Mark Thomas film, on the first public hearing into corporate malpractice held by the European Parliament’s Development Committee. This public hearing investigated Nestlé and Adidas. Nestlé was invited to send a representative, but refused to do so. Supporters of the boycott at several UK universities started to protest at Nestlé appearing on campus for graduate recruitments, arguing if it wanted access to campus it should debate with Baby Milk Action. Eventually Nestlé agreed and a series of debates took place at universities and colleges between 2000 and 2005. Often these coincided with student unions voting on whether to support the boycott – and as Nestlé lost the debates and boycotts went ahead or continued, Nestlé eventually began refusing to attend again. Anyone wishing to try to set up a public debate with Nestlé is welcome to contact Baby Milk Action. Nestlé continues to reject the four-point plan put to it by Baby Milk Action for saving infant lives and ending the boycott. It has yet to accept that the Code and Resolutions are minimum standards for all countries, most recently in a letter to Baby Milk Action in April 2014. Nestlé refuses to bring its policies and practices into line with the Code and Resolutions. However, there has been some movement. It took a nine-year by Baby Milk Action and its partners to persuade Nestlé to stop promoting complementary foods from before 6 months of age. 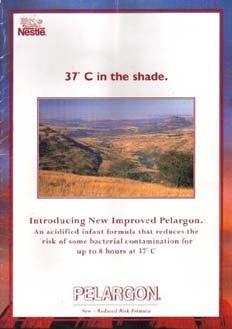 The World Health Assembly adopted a Resolution in 1994 stressing the 6-month age, but Nestlé only agreed to make changes nine years later, making the announcement during a week of demonstrations organised by Baby Milk Action in the UK. Nestlé portrayed this as the company taking the lead, as it usually does when it finally gives in to years of pressure. Another noticeable change has been seen in Nestlé’s public statements on breastfeeding. Baby Milk Action has long criticised Nestlé for stating it supports breastfeeding for 4 – 6 months, when the recommendation is exclusive breastfeeding for 6 months followed by continued breastfeeding and introduction of complementary foods (with a particular emphasis on promoting use of indigenous, local foods) into the second of year of life and beyond (for example see the Global Strategy for Infant and Young Child Feeding, 2003). In Nestlé’s 2010 policy it spoke of ‘exclusive breast-feeding in the first six months of life’, making no mention of breastfeeding beyond this. This is an important shift as can remind Nestlé of its stated support for breastfeeding for two years and beyond when we challenge it for undermining breastfeeding through this period with its aggressive marketing of follow-on milks and growing-up milks. Nestlé now promotes follow-on formulas for use past one year of age with exactly the same branding as the infant formula. Nestlé weakened its policy at this time as it was being reviewed for inclusion in the FTSE4Good ethical investment index. from the FTSE stock exchange listing company. This flawed system evaluates companies against their own policies rather than the Code and Resolutions. FTSE believed its collaborative approach with Nestlé would help force changes, but has actually resulted in driving standards down. Organisations such as Ethical Consumer include the fact that Nestlé is the target of a boycott in their assessments of products. See Ethical Consumer’s Nestlé profile. The Ethical Investment Research Service (EIRIS) has stated Nestlé is in ‘total or substantial violation of the International Code of Marketing Breast-Milk Substitutes’. The ethical investment sector as a whole excludes investments in companies that violate the Code and Resolutions and generally look to IBFAN’s monitoring for evidence. The only exceptions (much cited by Nestlé) are FTSE4Good and a company called GSI, which looks to company reports rather than independent monitoring of company activities. Mike Brady of Baby Milk Action (IBFAN-UK) raised Nestlé’s activities in Bangladesh as the Nestlé shareholder meeting in April 2015. The boycott is a way to show solidarity with people campaigning around the world to stop Nestlé’s aggressive marketing of baby foods in their countries. 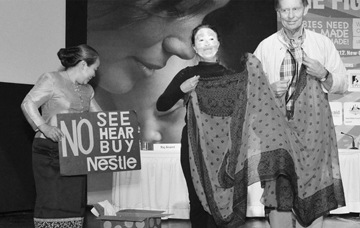 The image below is from a theatre piece on countering Nestlé malpractice performed at the World Breastfeeding Conference in Delhi, India, in December 2012.